Welcome to “engagement season,” the magical time between Thanksgiving Day and Valentine’s Day when nearly 40% of all marriage proposals take place. According to WeddingWire’s 2018 Newlywed Report, Christmas Day is the most popular day of the year to pop the question, followed by Valentine’s Day, Christmas Eve, New Year’s Day and New Year’s Eve. Interestingly, the WeddingWire survey of 18,000 U.S. newlyweds married in 2017 reveals a dramatic spike in proposals during the month of December. Throughout the rest of the year, the distribution of proposals during each month ranges from 7% to 9%. But, in December, that number rises to 16%. Experts believe that the winter engagement phenomenon is attributed to two factors: the romantic nature of the season… and convenience. Suitors likely choose December to pop the question because they love the spirit of the holiday season. And, certainly, there’s no better time to propose than when all the family is in town to celebrate with the newly engaged couple. #1. Christmas Day. It’s the biggest day of the year for gift-giving, so it makes perfect sense that this, too, would be the biggest day to give the ultimate gift — a diamond engagement ring. #2. Valentine’s Day. Cupid’s special day is all about love and expressing to that special someone just how much you care. Instead of delivering a bouquet of flowers or a box of chocolate, millions of romantic suitors opt for a proposal and a ring. #3. Christmas Eve. 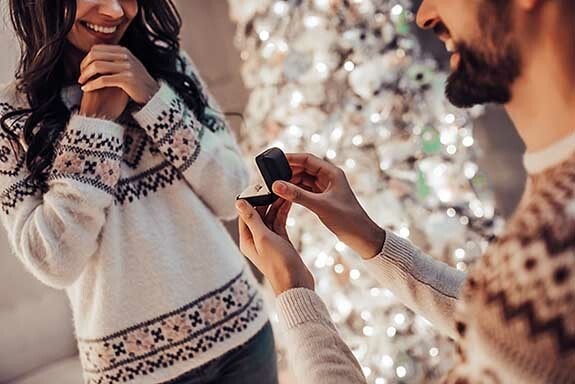 For the families who prefer to exchange gifts on Christmas Eve, this is the perfect time to add to the joyful holiday spirit by popping the question. #4 & #5. New Year’s Day and New Year’s Eve. We can’t imagine a better way to celebrate the New Year than with a surprise marriage proposal as the clock ticks down and 2018 makes way for 2019. Technically, if she says “Yes” before midnight, the engagement took place on New Year’s Eve, but if she says “Yes” after midnight, the engagement is credited to New Year’s Day. #6. December 23rd (Day Before Christmas Eve). In the same survey last year, 12/23 rated #9. We’re guessing that the ascent to #6 reflects more newly engaged couples choosing to get a jump on the holiday and avoiding Christmas Eve distractions that might take the focus off the bride and groom-to-be. #7. Two Saturdays Before Christmas Eve. It’s one of the biggest shopping days of the year. Might it be possible that the couples are out together, looking at engagement rings, making a selection and proposing on the spot? #8. Fourth of July (Independence Day). One of only two dates in the Top 10 that is outside the traditional “engagement season,” the Fourth of July — with festive fireworks and some time off from work — makes for a memorable day to pop the question. #9. Saturday of Memorial Day Weekend. This day marks the official start of summer and a perfect day to propose. A Saturday engagement allows the couple to extend the celebration with family and friends over the long weekend. #10. Saturday Before Valentine’s Day. New to the WeddingWire Top 10, the Saturday before Valentine’s Day may reflect the couple’s desire to celebrate their engagement over a weekend and not necessarily on Valentine’s Day, which often comes up during the week (in 2018, February 14 was on a Wednesday) and is certainly not a day when most people have off. Popping the question on the weekend prior to Valentine’s Day also preserves the element of surprise.